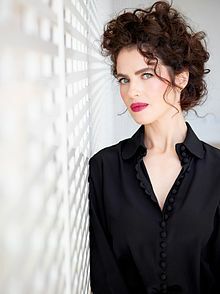 Neri Oxman (Hebrew: נרי אוקסמן‎; born 1976) is an American–Israeli architect, designer, and professor at the MIT Media Lab. She is known for art and architecture that combine design, biology, computing, and materials engineering. ↑ Antonelli, Paula (2008-01-01). Design and the elastic mind. NY, NY: Museum of Modern Art. p. 75. ISBN 9780870707322. OCLC 780473124. ↑ Hill, David J. (June 4, 2012). "3D Printing Is The Future Of Manufacturing And Neri Oxman Shows How Beautiful It Can Be". singularityhub.com. Retrieved June 4, 2012. ↑ "Material Ecology website". Retrieved October 15, 2011. ↑ "Material Ecology". The Dirt. August 20, 2009. Retrieved April 25, 2011. This page was last changed on 16 November 2018, at 09:20.